• It’s A Multi Media World. Yesterday it was office phones, faxes, mailers. Today it is cell phones, emails, IMs, texting, Facebook and Twitter. Yesterday information was obtained from phone books, yellow pages, printouts and your appointments were kept in a Daytimer. Today contacts, appointments, information are all in your mobile device. Radio gets its information about music digitally from music tracking, emails, websites, IMs, and digital advertising. There are no CDs in the control room, the whole operation is on a computer. • AirBlasts are Emails. It is sent to every reporting station's PD and MD’s laptops, numerous non-reporters, and every Consultant and Independent. It contains a visual of the band, information about the band including airplay, touring, sales, bio etc... a link to the song, a link to the video, radio programmers’ quotes, and contact information for label or management. • AirBlasts Are Economical. Given that your AirBlast can be updated and resent as many times as you want for the life of the single for one price, it provides the highest return on investment of any other marketing/advertising initiative. • AirBlasts Provide Professional Production And Database Management. Only when email marketing is assigned a proper budget and adequate professional marketing resources (not IT people) does it attract the appropriate level of attention. 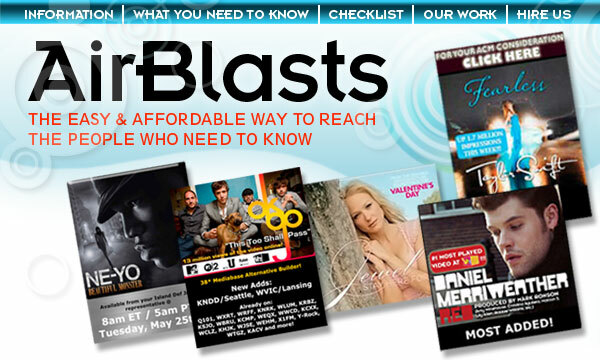 AirBlast utilizes Music Tracking, Mediabase, and Steve Resnik’s lists to continually update its mailing list giving you the most accurate mailings with fewer hard bounces than anyone else. • You Know Exactly Who Sees Your AirBlasts. Unlike website ads or daily update ads which are here today and gone tomorrow, and you never know who actually saw your ad, AirBlasts can be updated and resent every week, and you get an Excel spread sheet telling you exactly which PDS and MDS opened your AirBlast and looked at your information. This indicates an interest in your song.